Welcome back to the latest edition of Monday Morning Coffee. If you’ve stayed up to date with our recent market reports, you’ve noticed the housing spike in the market. This has us very excited to see where the 2015 market is heading. With the increased activity in the market, we recently received some interesting news regarding your ability to move this summer. The fact is that there will be a shortage of moving trucks and workers this summer. We are joined today by Brad Murphy, of Armstrong Relocation & Companies, who is going to tell us how we can be proactive about this potential shortage. Roughly 65% of a mover’s revenue occurs in 120 days of the year, and according to the employee relocation council, the housing market will be up by 15% by the end of the year. We are seeing numbers return that are similar to the numbers in 2007. But even with this increase in sales, the number of movers has decreased. We are currently operating with 30% less van drivers than we were in 2007, due to lowered pay and a tightening of industry standards. There is such a shortage of movers and vehicles, you may have an issue finding your own vehicle to rent to move yourself. So, how will this affect you? If you can’t move yourself, you need to make sure you find a mover and secure that space before it’s too late. If you wait longer than that, you may not find one, especially when it comes in June and July. 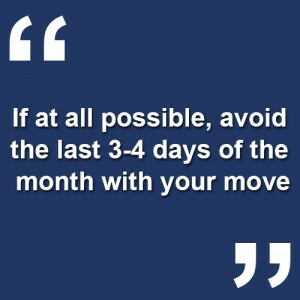 If at all possible, avoid the last 3-4 days of the month with your move, because statistics show that’s when the most people are moving. Do your best to be strategic with your move. If you have any questions for Brad or myself, feel free to give us a call or send us an email. Even if you aren’t planning to move this summer, share this article with someone who is, because they should know about this information as well. We look forward to speaking with you soon!